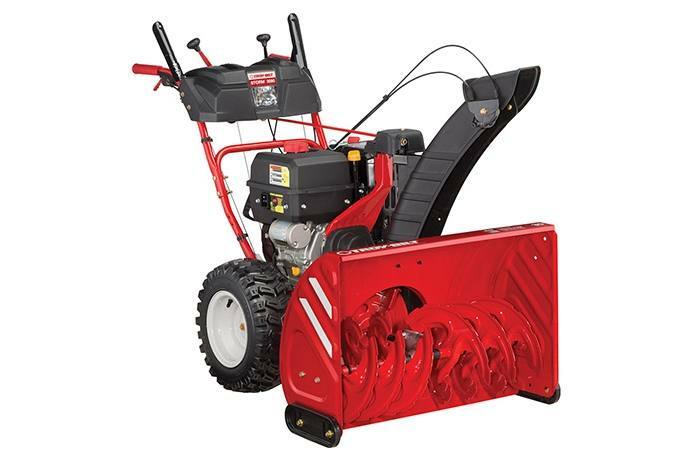 The Storm™ 3090 2-stage snow blower features a wide 30" clearing width, Touch 'n Turn® power steering and heated hand grips, plus an in-dash headlight and reflective strips for greater visibility in low light. It's easy to start, easy to operate and so solidly constructed, it's easy to see why this snow blower will tackle winter's toughest tasks and still be around for years to come. Touch 'n Turn® Power Steering: The Touch 'n Turn® power steering system is controlled by two easy triggers. Simply squeeze the trigger on the side you want to turn toward, and the unit's self-propelled drive system will turn the snow thrower for you. Just One Hand® Operation: Just One Hand® operation lets you guide your Troy-Bilt® snow thrower with literally one hand. Because the machine is engineered to be well-balanced and easy to control, it does the work - not you.